Additional cassette trays sold as part 163 0405. Snap 2.5" hard disks in and out of your computer as easily as exchanging memory cards. 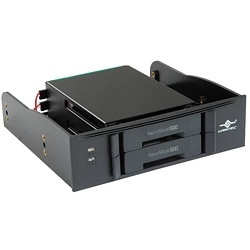 The dual bay NexStar SE Hard Drive Rack fits in a 5.25" drive bay and makes it super-simple to install or remove SATA drives. Simple tool-free cassette trays snap on to the drives... to install a drive, just slide it into the dock! Includes two cassette trays, SATA data cable, SATA power adapter cable, and mounting screws. Requires 2.5" SATA hard drives (not included) and Microsoft Windows XP+ or Mac OS 10.4+.